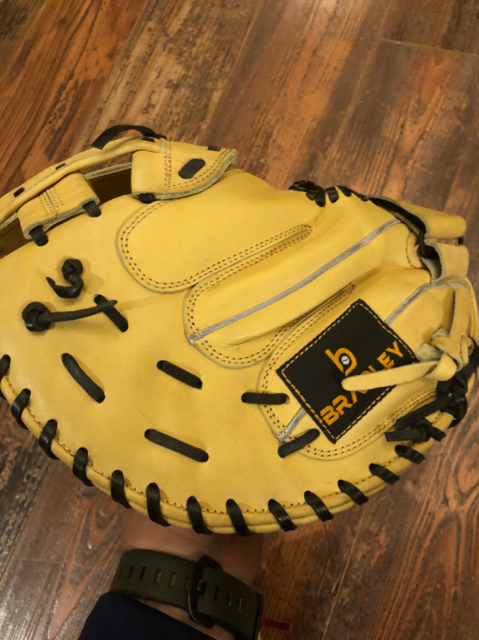 I’m a HUGE fan of Bradley Gloves for youth players and it was time for DS to get a new glove and DD has decided she wants to learn to catch (I really may not have needed much encouragement to buy new gloves anyway), so I went back to the well. DD has been using her 12” trap from Bradley since last January and darn near sleeps with it she loves it so much. Also- I’m a terrible photographer. Annasdad does a much better job. 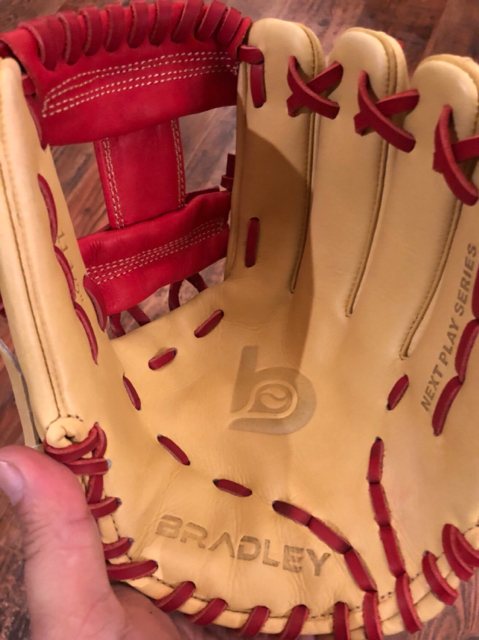 Gotta say, not the biggest fan of the logos / patches on the I-web glove but I love the pattern, that’s a great looking glove!! Even though I have 3 Pro1000 gloves which is essentially part of Rawlings Pro200 family, I now only look for gloves like yours with the fold over palm / crotch like the Rawlings NP series has. Love your line about not needing any encouragement to buy new gloves.......my man! What size is the I-web glove, 11.5”? And what leather do they use on that series? Be careful not to let those red laces bleed onto that blonde leather. Yeah, it’s 11.5”. I don’t love all of his branding (some of the gloves have different branding) but I don’t hate it either. These use premium java steer hide. I don’t know a ton about that but these gloves are stiff enough to need some break in but not so stiff that a youth player can’t do it over an off-season (He is a big fan of kids helping break in their own gloves). Both of my kids love knowing they broke their own glove in. Speaking of that- Neither of my kids have ever caught. I need to pick some brains around here about breaking in or shaping that catcher’s mitt. Those are great looking gloves. My DD has a 11.75" Bradley Next Play single post and loves it. She has a small hand so the spread on the finger stalls was a problem with other gloves. The Bradley finger stalls were just right. I recommend them to all the parents. That's the exact same reason we went with Bradley initially, last spring. 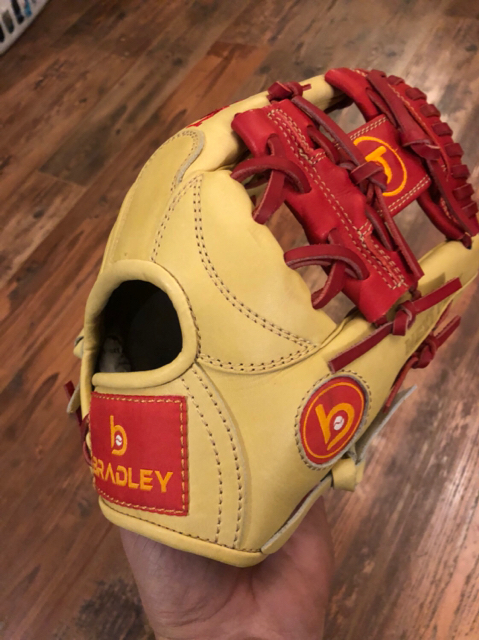 She's 10 and a half but she's 4' 2" and around 60 lbs so she wanted a glove that would hold up to 10u+ ball but she doesn't have a 10u hand lol. as for breaking in catchers mitt, perfect timing for that. condition it, no need to go on about that, plenty of threads on which products people like. but since it is offseason, find some pitchers about their age that take weekly lessons, and see if she can catch for them at lessons. make certain you and they both realize that initially, may be tough to squeeze pitches, especially for slower pitchers (fast pitchers basically force the ball deeper into the mitt which kind of forces it to squeeze the ball). also will help them develop catching skills, just make certain not to develop bad habits (kneeling, sitting, trapping ball under mitt, etc.). My wallet is telling me I need to stop looking at these glove threads..amazingly my wallet's voice sounds eerily similar to my wife's voice..
Lol, remember the stupid quote about asking for forgiveness after the fact? You just need to adopt OsDad's philosophy about not needing much encouragement to buy new gloves! There's nothing like that kid in the candy store feeling waiting on and then opening that new glove box! There's a reason that I made sure to get to the mailbox first yesterday.